You can see photos from the 1st Sketchcrawl held by Urban Sketchers London on a very hot and sunny day on Saturday on Photos from the 1st "Let's Draw London" Sketchcrawl on the Urban Sketchers London blog. We have delayed the Urban Sketchers London first sketchcrawl until Pete Scully - our North London blogger pal who now lives in California could join us. 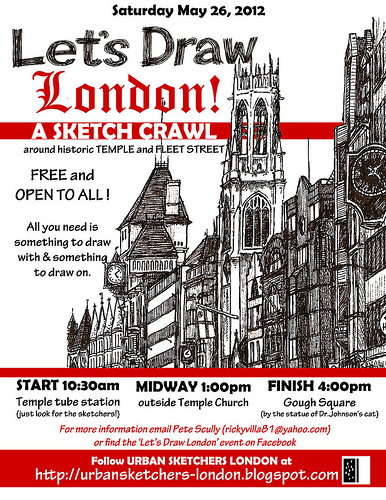 Today we'll be sketching the area around Temple and Fleet Street. Which means I'll be at Temple Underground station at 10:30am this morning! Sketches and report back later. You can read more about the Sketchcrawl in Reminder: Let's Draw London Sketchcrawl this Saturday on our Urban Sketchers blog. 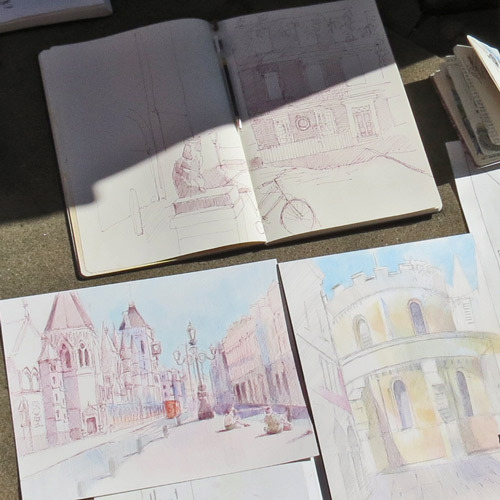 You are invited to the London Launch of The Art of Urban Sketching: Drawing On Location Around The World which contains work by London based correspondents. 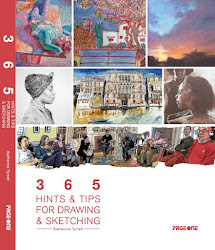 'll be with my fellow founder members of Urban Sketchers London at Cass Arts Islington on the afternoon of Saturday 19th May for an event to celebrate the launch. 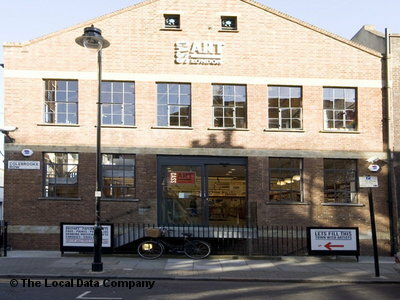 WHERE: Cass Art Islington, 66-67 Colebrooke Row, London N1 8AB Click the link for a map of where this flagship art store is located. Buses: Put "Colebrooke Row Borough of Islington, N1" into the TfL bus maps and it will identify all the buses that run near to Cass Arts. The click the number of the bus to see the route and the bus stops. I'll be on the 205! 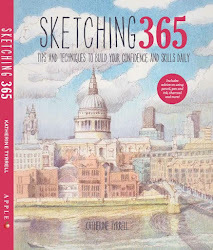 We intended to have this launch to coincide with the launch of Urban Sketchers London on 1st March - but then realised that we'd be trying to have a book launch with no books. 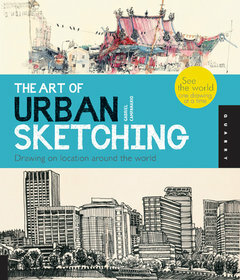 The Art of Urban Sketching had proved to be so popular that it was almost impossuble to get hold of a copy by March! 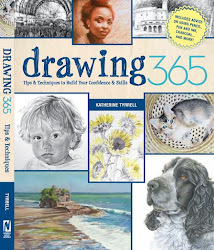 A second reprint had to be ordered within six weeks of it going on sale - and we've had to wait for the new books to arrive! pen and sepia ink in small Moleskine Sketchbook, 8" x 10"
People who don't live in the UK often comments that we talk about the weather all the time. That's because unlike all those souls who live on massive tectonic plates where the weather tends to stick around for a long time - the UK is an island and a maritime nation and our weather is very much influenced by what's happening to the sea. Thus the weather can change season from day to day and hour to hour. April 2012 was the coldest April since 1989, the dullest since 1998 and the wettest since 2000. More remarkably, it was around 1C colder than March, a rare, but not unprecedented occurrence. 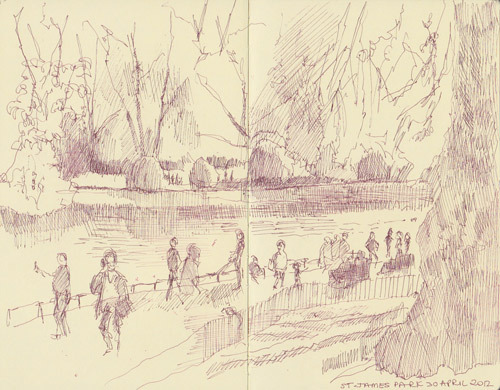 Which is why, last Monday afternoon, when I got to sit in the sunshine and sketch in St James Park it felt wonderful! I was so busy last week I didn't have a chance to post the sketch I did until now - so here it is. 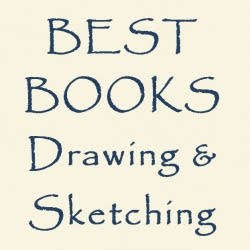 No coloured pencils, just pen and ink in a small Moleskine sketchbook as that was all I had with me. There are lots of places in London where you can draw people passing by - and the cafe in St James Park - Inn the Park - is one of them.